We are a husband and wife team, Jessica & Miguel. We take pride in treating our clients like we would our own family. Jessica is a trained acupuncturist with a Masters degree in traditional Chinese medicine, and she has used the skills she developed to craft our signature lice removal products and combing procedure. Miguel is a former musician turned digital marketing guru, who teamed up with Jessica to create the brand and scale it across all of California. We have been perfecting our company’s organic lice treatment technique and improving our service consistently for Eleven years. Treating lice started as a part-time job for Jessica, while she was finishing grad school for Traditional Chinese Medicine. 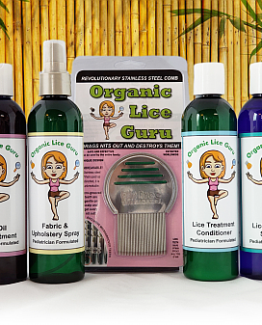 However once husband and wife teamed up they generated such a demand for Organic Lice Guru’s services that it quickly developed into a full-blown business with more clients than we could handle. To ensure the highest level of service for all of our clients, Jessica continues to perform many of our treatment sessions herself and she personally trains all of our lice technicians to administer the same level of care she would give her own family. We’ve truly enjoyed building a company that helps so many families. You and your families make this work so rewarding, which is why we feel so lucky to do what we do. The satisfaction and appreciation received from bringing much-needed relief to a ​stressed-out family never gets old! We are always available to answer questions, so please feel free to give us a call or email at the info listed below.